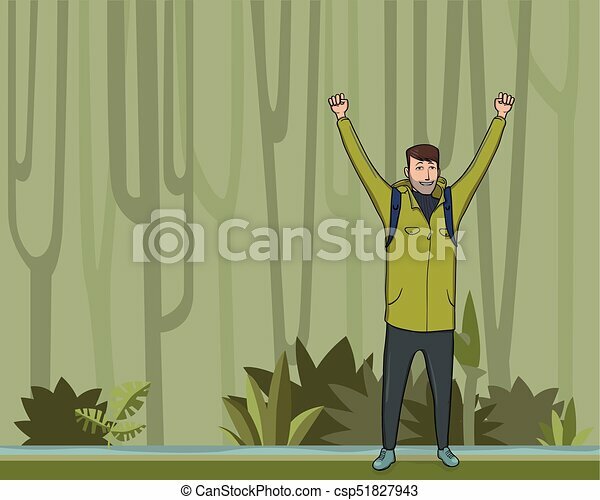 A young happy man, backpacker with raised hands in the jungle forest. Hiker, Explorer, mountaineer. A symbol of success. Vector Illustration with copy space. 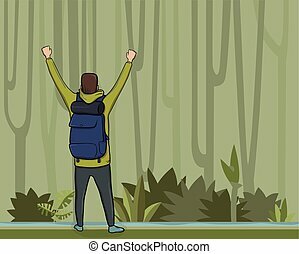 A young happy man, back view of backpacker with raised hands in the jungle forest. Hiker, Explorer, mountaineer. A symbol of success. Vector Illustration with copy space. 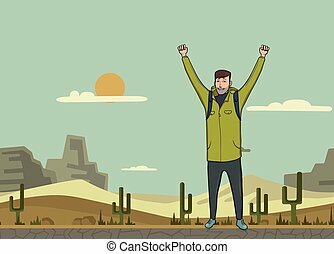 A young happy man, backpacker with raised hands in the desert. Hiker, Explorer. A symbol of success. Vector Illustration with copy space. 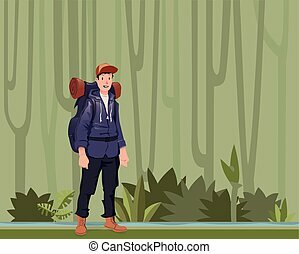 A young happy man, backpacker standing in the jungle forest. Hiker, Explorer. Vector Illustration with copy space. 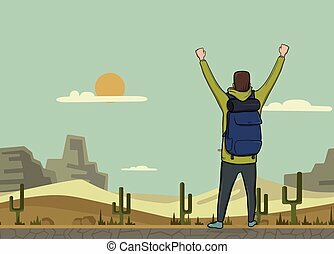 A young happy man, back view of backpacker with raised hands in the desert. Hiker, Explorer. A symbol of success. Vector Illustration with copy space. 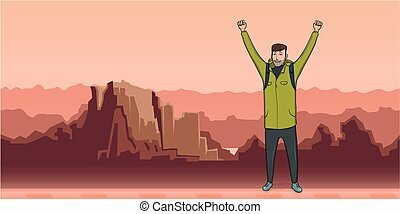 A young happy man, backpacker with raised hands in mountain landscape. Hiker, Explorer. A symbol of success. Vector Illustration with copy space. 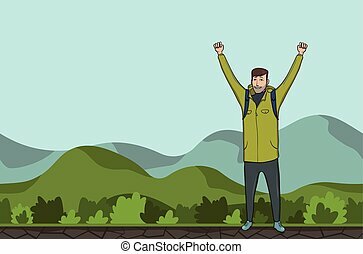 A young happy man, backpacker with raised hands in a hilly area. Hiker, Explorer. A symbol of success. Vector Illustration with copy space. 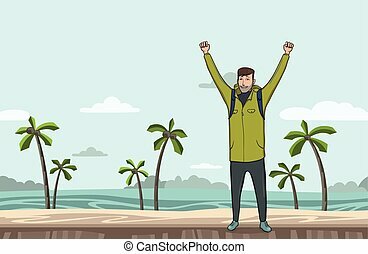 A young happy man, backpacker with raised hands on the sea beach. Hiker, Explorer. A symbol of success. Vector Illustration with copy space. 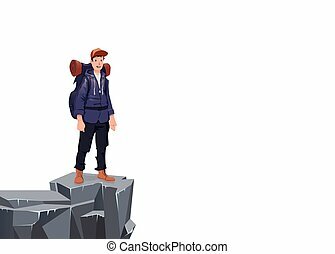 A young happy man, back view of backpacker with raised hands in mountain landscape. Hiker, Explorer. A symbol of success. Vector Illustration with copy space. 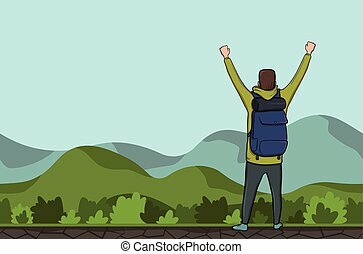 A young happy man, back view of backpacker with raised hands in a hilly area. Hiker, Explorer. A symbol of success. Vector Illustration with copy space. 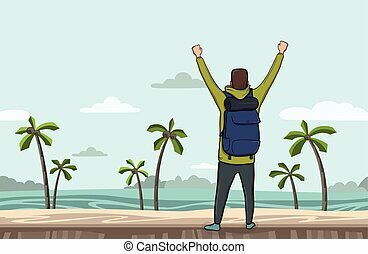 A young happy man, back view of backpacker with raised hands on the sea beach. Hiker, Explorer. A symbol of success. Vector Illustration with copy space. A young happy man with raised hands on the edge of the cliff. Mountain hiker, Explorer, mountaineer. A symbol of success. Vector Illustration with copy space on white background. A young happy man on the edge of the cliff. Mountain hiker, Explorer, mountaineer. A symbol of success. 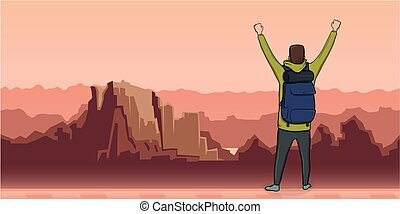 Vector Illustration with copy space on white background. 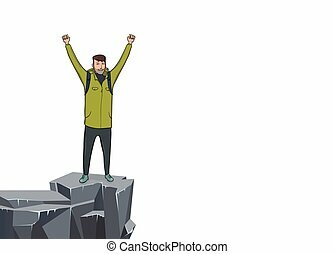 Back view of young happy man with raised hands on the edge of the cliff. Mountain hiker, Explorer, mountaineer. A symbol of success. Vector Illustration with copy space on white background. Happy young man on the morning walk in the city Park. 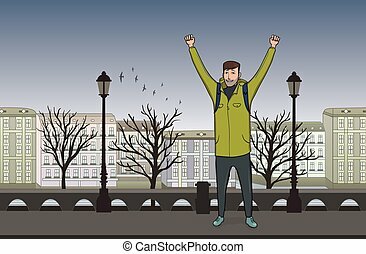 A tourist with their hands up, a gesture of success to goals. Vector Illustration. Happy young man on evening walk in the old European city. 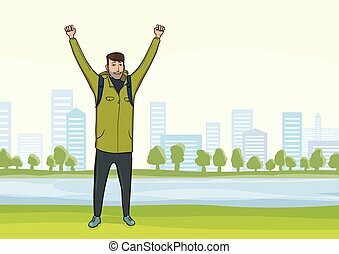 A tourist with their hands up, a gesture of success to goals. Vector Illustration.